Or in this case: array the table with the fabric and porcelain version of an elegant version of the holly leaf motif. Shiny green leaves and red berries have always brought a note of color into the winter landscape and these were borrowed to make "the season bright". Lenox produced a classic pattern that creates a special celebration with linens and tableware. I like the clean crisp look of holly, the way the leaves are shaped, and the bright red berries, it's no wonder that this plant spells a traditional Christmas theme. The design for tables by Lenox is done in their usual refined way, which makes an elegant look for either formal or casual family occasions. 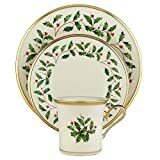 The fact that this line has a myriad of accessories for coordinating all the serving needs of every type of fete is another reason to collect a holiday dining room service set in this pattern. Completely affordable fine dinnerware by the famous Lenox company. Special holidays call for a special tablesetting, and this holly sparkled set will loved year after year. Like the Holly designs, the Winter Berry borrows its look from nature in winter. The surprise of red berries and bit of evergreen foliage against an expanse of winter white background. The graceful addition of bows lends a festive and lively feeling of animation to the table. Does a Christmas theme that is traditional in your family make you happy each holiday season? Or do you change things up with the latest trends in colors and designs? Look at a few of the newest ideas dreamed up by designers and taste-makers. I love collecting holiday theme ideas on my Pinterest board. Come See! Christmas Ideas help make a fresh look out of traditional decorations. It is part of the fun of the holidays. Homespun, red checks, and simple home made look ornaments and decorations. Another theme that is trending which is rustic and cozy. Purples... greens... brights. That is a modern looking direction that this season's decorating is taking. Bright and Fun. Elegance, beach house colors and motifs, a little bit of silver glitz. I added to these reported fashions the "Cultural meets Christmas" idea with popular favorites of Scandinavian and Scottish Christmas styles which I think are ideal for the dining room and holiday meals. The Scandinavian style is one that spans a long time in history reaching back into its pre-Christian times for some elements (the Julebukk, for instance), but manages to always look contemporary. The Scottish tartan has been a time honored Christmas theme since Queen Victoria popularized it. They could be thought of as two different ways to have a Homespun Christmas style which is always one that is essentially frugal. Each of these mentioned styles fit in with the trend to recycle, upcycle, and re-purpose as a Christmas decorating trend. Surround your candle with attached peppermint candy canes. Decorate the table with pine cones. Large ones topped with cookie stars or glittered cardboard stars for centerpieces, small ones brushed with metallic paints for napkins or small gift toppers. Hang a small string of jingle bells to the chair backs. Add a sprig of holly or pine, if you like. Make bows of burlap, hearts of tartan fabric and string them for a garland on the sideboard. Easy fabric flower napkin rings in the color to match your theme. The Scottish Theme can go light with the Symbolic Scottish Thistle. Green and white make a beautiful background for a fine Christmas feast. Red tartan plaid- whether from a throw or tablecloth, bright silver sleigh bells and berried pin sprigs, all combine with candles and good repast to bid a Merry Christmas. Cheerful, and frugal way to celebrate during the holidays. And it can be as posh and luxurious as damask or lace. Tartan ribbon brings a touch of Scottish charm in the most elegant dinnerware, Lenox Holiday Tartan design with 24 karat gold accents. This will become an heirloom set. Fine china made in the USA, this gorgeous design has a Scottish tartan motif and a gold trim which works perfectly with some of the best Christmas themes. Accented with 24 karat gold, it is also dishwasher safe. Celtic Christians created intricate and meaningful designs, especially meaningful if you have an Irish heritage. A green tartan can be substituted for the red with all the other elements of a Scottish Christmas Table: the silver, bright crystal glasses, and Christmas greenery. Celtic Glass Designs Set of 2 Hand Painted Wine Glasses in a Celtic Trinity Knot Design. Sparkle the table with beautiful color and design, imagine these glasses filled with ruby libations. The Celtic design shows off your heritage at this time of year, when family gatherings are full of fun and traditions. Spode has an impressively wide range of dinnerware and table accessories in the Christmas Tree designs. Whether you mix and match or add just a few accents to your table it instantly spells out a cheery holiday message. Christmas trees and peppermint stripes are the most festive pairings of all. I have to confess a predilection for peppermint colors, it is the color combination I personally chose for my own Christmas theme. I combine candy stripes, Scottish Tartan ribbons, and a traditional red and green color scheme throughout my home. Predominantly white décor has always had an understated elegance that decorators love. 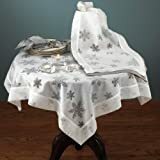 Borrow that understanding to outfit your Christmas table with white and just enough sparkle to shine and stand out from the rest of the year, because if there is anytime that glamor and glitz is welcome it is on cold wintry nights during the Christmas season. Add some subtle color with simple placemats. What is easier than two table runners and hanging Christmas decorations above the heads and out of the way from carrying on jovial conversations? Candles add romance and nothing is easier or more elegant for a Christmas holiday meal. Use your silver serving pieces in the "Holiday Sparkle" theme. Display beautiful cupcakes dressed up with silver dragees as a start for an elegant dessert table..
Silver, white and a pastel (I love the pale greens, but any cool toned pastel would work) bring a winter fantasy look to a table. Find a fancy tablecloth with burnouts, edged with silver or metallic threads, and bring on th eshimmery ornaments. This look is wonderful for formal events. Nothing is quite as glamorous as silvery, glitzy shine and pale colors that simply shine in the evening candlelight. Make buffet desserts or plates shine with elegance. Silver and snowflakes creates a sparkle and help keep the décor light and bright on cold winter nights. It makes you think of the first winter snow, even if the temperatures outside don't cooperate. This setting theme makes the food first place. One of my favorite looks for the Christmas season is the simple, clean look of Scandinavia. It often starts with a pure snow white, then brings in brights, usually the color red. There are plenty of natural and homespun accents, which adds to the appeal. In a table setting nothing could be easier, yet full of Christmas warmth and decorating drama than this style. It doesn't compete with the festive foods, but holds plenty of the Christmas season conviviality. Red and White Danish flags are a traditional decoration for the tree at Christmas. Use them for the table and centerpiece, too. Create the setting simply, use stars for Christmas significance, and lots of red and white candles. Natural accessories in light wood or ornaments of straw help give this cultural style its warm simplicity. Homespun with class and elegance with beautifully presented foods. Don't overburden the Scandinavian table, instead allow each well chosen element stand out and shine in the light of the candlelight. Scandinavian embroidery is a nice touch for napkins, tablecloths, or table runners. Perhaps you don't have time to create the handcrafted look you long for- just buy something that gives you the homey look and express yourself decorating. Pull out your folk art items: plates, candle holders, even cookie cutters and use them in layered table place settings and centerpieces. Homespun check fabric, burlap, rough linen, crocheted cotton... all have a varied look, yet all speak of a home made, old fashioned Christmas. Ideal Early American look- this is a good place for Colonial style accessories. Although red hues pair with white and green, accented with the natural browns of burlap and other materials, don't forget other colors which can be paired with handcrafted table linens - orange or blue are also holiday favorites and might be better color choices for warmer climates. Winter birds lend their color and grace to tableware perfect for the holidays. Elegant gold trim gives a rich sparkle to the table decor. This article reposted from my work on Squidoo (now closed) , first published by Ilona1 on 08/23/12 copyright to Ilona Erwin.